The Shira scheme is one of the Hydro's more interesting experiments. A complex little scheme, it was built over a long period (started 1948, finished 1959), and it featured the first experiment with pumped storage in the UK, at Sron Mor, and the most powerful single turbine installed in the UK, at Clachan. Although Shira was built and operated as a single scheme, I've split the discussion on these pages up by power station, so this section will concentrate entirely on Clachan. 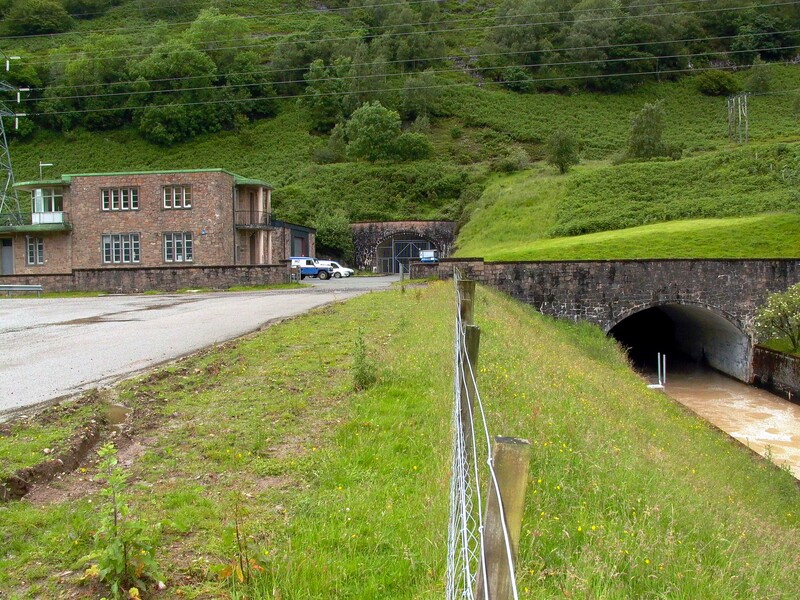 Clachan itself is a high-head (960ft) development of the 'traditional' kind (dam, low-pressure tunnel, surge shaft, high-pressure shaft/tunnel, power station, short tailrace). Storage is provided at Lower Loch Shira, which has been created by two dams, one gravity, one earthfill, situated in a gorge downstream of the Sron Mor/Upper Loch Shira section. Lower Loch Shira receives the discharge from Sron Mor power station, which is in turn supplied from the main storage reservoir of the scheme at Loch Shira. Water is taken from an intake structure adjacent to the Lower Shira dam into the low pressure tunnel, 6 miles long by 11' in diameter, to the junction with the expansion chamber, inclined surge shaft, and surge pond. From there the water falls down a steel-lined high-pressure shaft, inclined at 39º, at the base the shaft becomes level, and turns to lead to the MIV at Clachan power station. 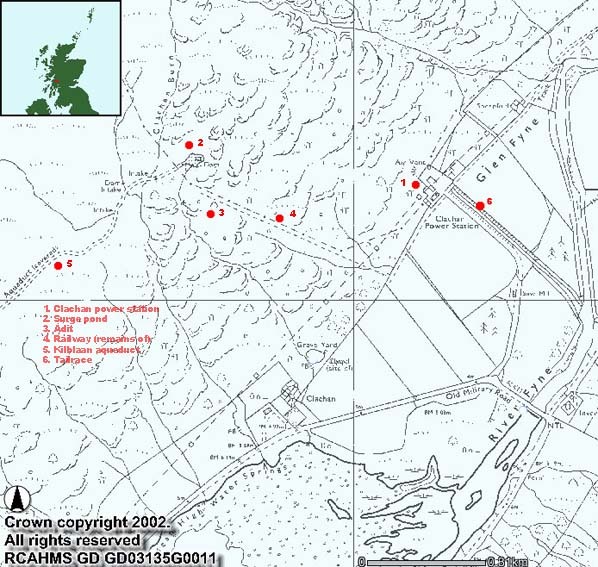 Clachan was constructed (just) underground, using the 'cut & cover' method. After passing through the turbines at Clachan, a short tailrace tunnel leads to a long tailrace canal, which discharges the water into the river Fyne close to the point where the river enters the sea at the head of Loch Fyne. The water from the Lower Shira reservoir is supplemented to a considerable degree by two major systems of aqueducts and diversion tunnels; the Kilblaan section leads water into the top of the surge shaft, the Brannie section water flows into the main tunnel where it surfaces briefly to cross the Brannie Burn. 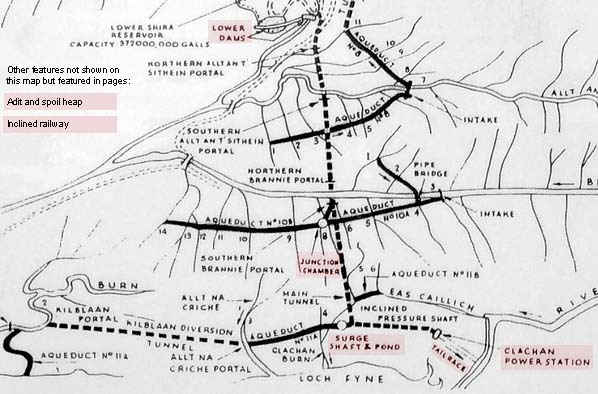 A noteworthy feature of the scheme is the way the levels of the intakes and tunnels were so arranged that, when Clachan power station is not running, the water from these diversions flows backwards up the main tunnel, to replenish the Lower Shira reservoir. There are 39 images of Clachan in the Records, and 7 webpages. They may all be accessed via the map at the bottom of this page, which is a clickable image map. Each area selected will open in a new window.